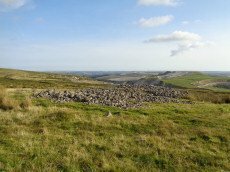 Notes: "This ring and stone row is now covered by china clay waste. 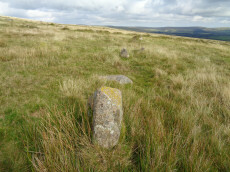 A stone row and circle on top of a low ridge, between Tory Brook and a tributary of the Yealm, near Cholwich Town. The row, extending over 700ft, consisted of uprights 2-3ft. high and 3ft. apart, the circle, at the northern end of the row, was 15ft. in diameter with seven upright stones. The site was excavated in 1961, and the sockets of many missing stones were found, also a pit 8ft. in diameter in the centre of the circle." Pollen analysis suggested the row was originally in a clearing of a wooded area. Notes: Turner Stone Circle G27. Site of former cairn circle. "the row, extending over 700ft, consisted of uprights 2-3ft. high and 3ft. apart, the circle, at the northern end of the row, was 15ft. in diameter with seven upright stones. The site was excavated in 1961, and the sockets of many missing stones were found, also a pit 8ft. in diameter in the centre of the circle. " Notes: Turner D19. Dixon #43. Bar Rep. 43. Butler Dendles Waste S. - Vol. 3. Map 52.15 (diagram p.194). Grinsell CORNWOOD 14. "The circle, consists of eight flat slabs, set on edge and has an internal diameter of approximately 3.4m. Some of the stones from the western quadrant of the circle are missing; a single earthfast stone is all that survives. The rectangular cist lies roughly centrally within the circle and is oriented E to W. It measures 1.2m long by 0.6m and 0.5m deep with slabs still in place both sides". Lethbridge diagram p.63, photo p.64. Notes: Located on Lee Moor. "The 'Hanging Stone' or 'Leaning Rock', 7ft 9ins in length, but because of the stone being 38o out of the vertical, its vertical height is only 6ft 9ins. It measures 3ft 7ins by 1ft 10ins at the base, and is incised on one face with the letters "CB" showing that at one time it was used as a bound-post. It is believed to be prehistoric." TDA Vol. 72 1940 pp. 192-3 (R Hansford Worth). 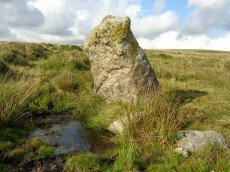 See also, Legendary Dartmoor: The Hanging Stone. Notes: "Scattered settlement of at least 12 circular huts, some of them being very large. Possibly Romano-British as opposed to the Bronze Age/Iron Age settlements nearby. Later rectangular house on south edge of area". 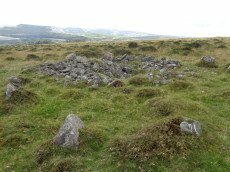 Lethbridge p.63-64 Hut Circle with largest door jambs (over 4 foot tall) on Dartmoor. Notes: Turner E7. A tumulus with a retaining circle, in poor condition. Diameter 12m, height 0.5m. "A cairn, about forty feet in diameter, from which almost all the stones have been removed and the central cist destroyed. It was surrounded by a circle of upright stones from one to three feet high, and to the west a row of two pairs of stones." 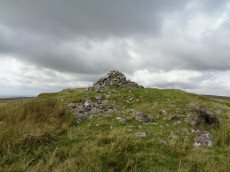 Notes: "A round cairn, 22 metres in diameter and 1.7 metres high, lies on the summit of Penn Beacon, at 430 metres above O.D. 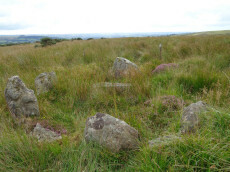 It is of small boulders and has been much disturbed, with a central hollow, 8 metres in diameter and 0.8 metres deep, and a modern marker cairn, 1 metre high, on the south side". Lethbridge p.62-3 suggests possible ruins of chambered cairn (diagram p.59). Notes: "A single stone row, sixty-six feet long, the largest stone being about 2 1/2 feet high. This row is no more than a remnant". Lethbridge p.62 Penn stone row - diagram p.59. Notes: Turner Stone Circle G21. "10 stones standing, one a boulder" (Turner). The closest possible NMR entry that could fit refers to natural boulders. 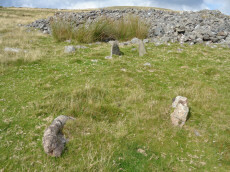 Butler refers to a possible cairn at SX60236153 "a semi-circle of slabs amongst the rocks of Rook Tor are obviously artificially set - remains suggest the site of a cairn, entirely demolished but for the retaining circle." (Butler Vol. 3. p.182). An alternative NMR entry refers to a hut circle at SX60866173, see: SX 66 SW 119. NB. Turner gives NGR SX61276148 - from satellite imagery this is way to the east away from outcrops and seems likely incorrect. This record sticks with Butler's grid reference. Notes: Not listed in NMR. Discovered by Lethbridge in 1992. Butler Vol. 3 Map 51.9. Oval cairn at the higher end. Orientated just west of north and 73.5 m from the cairn is a massive fallen longstone 2.7 m long which is probably the terminal stone of the row. There are 31 of 47 original stones visible in the row, all but a few either flat or leaning. Lethbridge p.59-61 diagram p.59, 61.